Do you enjoy celebrating St. Patrick’s Day? I do. And yes, I’m of Irish ancestry. But you don’t have to be Irish to celebrate the day of the Patron Saint of Ireland. You probably should believe in leprechauns, but that isn’t necessary either. The only requirement to celebrate St. Patrick’s Day is to enjoy having fun! For starters, try making green shaving cream arts & crafts. I always make St. Patrick’s Day cards for my family and friends. It’s easy, and everyone loves getting a card that’s unique. Let’s take a look at how to make a lovely St. Patrick’s Day card that’s very simple and can be personalized especially for the recipient. Place adhesive foam between them. 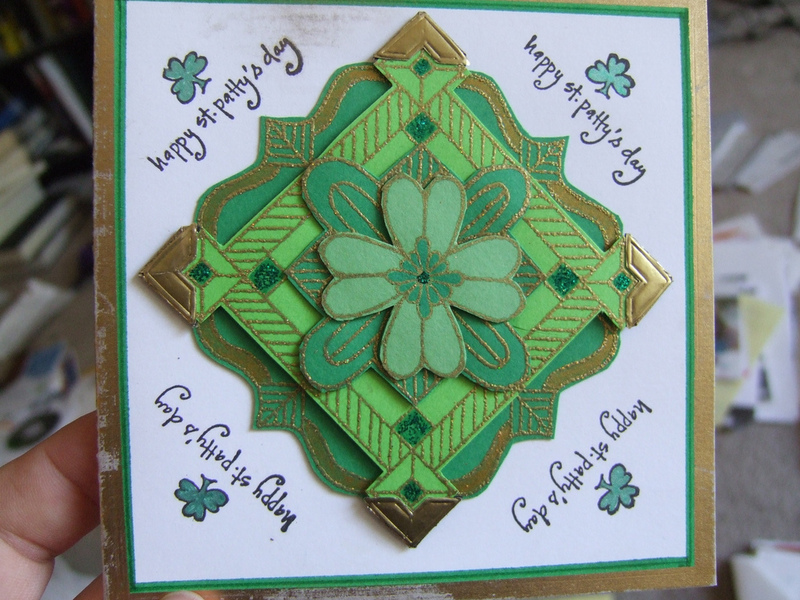 Adhere the shamrock to the front center of the card. Place brads on all 4 corners of the cardstock to frame the shamrock. Use a glue gun to fasten the green cord between the brads. Print or write an Irish Blessing on the inside right panel of the card or personalize it in any way you wish. Here are lots more handmade St. Patrick’s Day cards you can make. There are dozens of ways to decorate your home for St. Patrick’s Day. Make shamrocks out of green construction paper, attach fishing line and hang them from chandeliers, window frames and from the ceiling. Green leprechaun pots of gold are available at most dollar stores at this time of year. Fill the pot chocolate coins that are wrapped in gold foil. Now you have your very own pot of gold! Wreaths are always nice to display on your door. This Pot ‘o Gold wreath will bring a festive look to welcome visitors to your home on St. Patrick’s Day. In a well-ventilated area, spray the wreath foam black. Adhere the gold balls to the center of the wreath, filling it completely. Cover the wreath form with the green foil wrap to make your very own pot of gold. Here’s a similar St. Patrick’s Day wreath you can make. It’s always nice for ladies to wear a brooch that reflects festive occasions. These instructions for a cute Leprechaun pin are simple and easy. Cut the green felt in the shape of a top hat. Make a hat band using the black felt. Glue hat band to the hat, just above the brim. Cut a square out of gold felt. Glue to the front center of the hat band. Cut a slightly smaller square out of black felt. Glue to the center of the gold square to create a buckle. Glue the brooch pin to the back of a hat. Here are instructions for making a shamrock pin. Another thing I would encourage you to do is to go green for St. Patrick’s Day, if only for one day!